Microsoft has released Technical Preview edition of Microsoft Office 2007 SP1 (Service Pack 1) to a small group of testers and members of Microsoft Office Product Evaluation TAP on Microsoft Connect. This release is a pre-beta, meaning it’s not suitable for average users, except technical savvy who can deal with bugs. If you not facing any problem with Office 2007 products, suites or applications, the official beta version may be released soon, as feedback window for this technical preview edition is just 30 days till mid September. For Connect users those wants to try out and install the Office 2007 SP1 Technical Preview, they can download from Connect website, after logging in. However, for others who really wants to get a hand on Office 2007 SP1, the setup installer package has leaked to Internet and been posted on various torrent sites, and available for free download via BitTorrent network. You will likely to be able to download the SP1 Technical Preview via ED2K (eMule) P2P network. The Office 2007 Service Pack 1 Technical Preview package has the name of Microsoft Office 2007 SP1 v12.0.6207.1000, apparently released by NoPE. The main contents of SP1 is all updates released till this day for Office 2007 System. After installing and upgrading, the Office 2007 will show Office 2007 Service Pack 1, based on build 12.0.6207.1000. Download Microsoft_Office_2007_SP1_v12_0_6207_1000_US_EN_NoPE.torrent (removed due to Demand for Immediate Take-Down: Notice of Infringing Activity for Microsoft Corp ID : 58201006284c283932e2f81 from Hervé lemaire at herve.lemaire@leakid.com) to download via BT client. This original leaked download has the setup file divided into 44 pieces, which in turn contains another level of archive packing. Thus another user has packed the archive so that it contains the setup installer direct in one piece. To download this release, download the Microsoft_Office_2007_SP1_Setup_[NoPE].torrent (removed due to Demand for Immediate Take-Down: Notice of Infringing Activity for Microsoft Corp ID : 58201006284c283932e2f81 from Hervé lemaire at herve.lemaire@leakid.com). 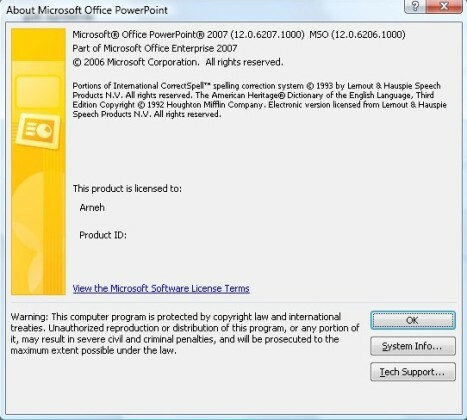 You can also directly download the Office 2007 SP1 Technical Preview setup file npmo7sp1.exe. But install this Office 2K7 SP1 pre-beta release at your own risk. UPDATE: Official final Office 2007 SP1 has been release for download.